CAPE GIRARDEAU, Mo. 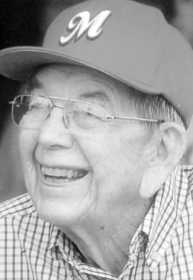 — Judson Marshall Willis Jr., 93, died Feb. 18, 2019, at Saint Francis Medical Center in Cape Girardeau. Born March 20, 1925, in Bloomfield, son of the late Judson Marshall and Coatney Welker Willis Sr., he was a veteran of the United States Army Air Corp, where he served as a navigator on a B-24 Liberator during World War II. On Dec. 6, 1944, his plane was shot down over Gyor, Hungary. He was a P.O.W. from Dec. 6, 1944, until May 1945. After the service, he attended Southeast Missouri State University and Missouri School of Mines and Metallurgy (now Missouri S & T), where he received his engineering degree. On April 3, 1947, in Rolla, he married Catherine Tyler Willis, who preceded him in death on April 2, 2002. Survivors include one son and daughter-in-law, James and Annette Willis of Farmington; one daughter and son-in-law, Terri and Don Adams of Matthews; a daughter-in-law, Beth Willis of Kennett; and six grandchildren and seven great-grandchildren. He was also preceded in death by two sons, Judson M. Willis III, and Steven S. Willis; three brothers, James H. Willis, Jess Willis, and Ray Willis; and one sister, Mildred Bernard. Visitation was from 5 p.m. to 8 p.m. Feb. 22 at Nunnelee Funeral Chapel in Sikeston, where services were at 10 a.m. Feb. 23 with the Rev. Dan Wisely officiating. Burial followed in Bloomfield City Cemetery at Bloomfield. Pallbearers were: Michael Willis, Andrew Willis, Dee Adams, Daniel Adams, Patrick Mills, and Mike Perry. Honorary pallbearers were: Amanda Willis Mills, Marshall Adams, Landyn Adams, Keaton Adams, and Wesley Adams. Online condolences may be shared at www.nunneleefuneralchapel.com.